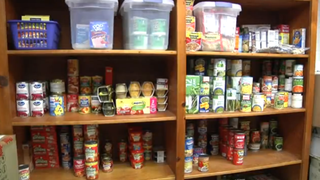 A Beaufort County, N.C., high school, committed to making sure students in need can get food without being embarrassed about it, has started a food pantry, WNCT reports. According to the report, the idea for the food pantry started out as a student government project at Washington High School, but the benefit of having the resources available permanently soon became clear. "We wanted to focus on those that need it, but they don't want to tell us that they need it," senior Erin Lewis, who helped start the pantry, told WNCT. The pantry offers students nonperishable food items as many times as they need, with no questions asked. The pantry is anonymous, but the news of its existence spread by word of mouth, with no advertisements or fliers. Project supervisor Laura Thompson said that the pantry was really there to show students that school was more than a place to come to pass tests and get a grade. The school is hoping to grow the pantry, which currently also carries school supplies and clothes, and add perishable items for the dozens of students who already use it.